The case for adding a small, lightweight, and portable hand blender to your kitchen arsenal. A regular old countertop blender is a fairly standard piece of equipment in most homes, and if yours is a good one, it should be able to handle the full range of essential blending tasks—puréeing fibrous vegetables and crushing ice with equal ease, and doing at least a credible job of emulsifying sauces, like homemade mayonnaise. Why would you bother cluttering up your precious kitchen workspace by throwing an immersion blender into the mix? The answer is, usually, convenience. 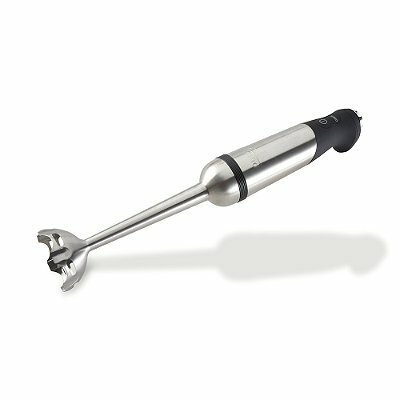 An immersion blender, also known as a stick blender or hand blender, is small enough to be stored in a roomy-ish drawer and light enough to be pulled out with a single hand. Meanwhile, its simple construction and ability to blend directly in a pot, measuring cup, or jar makes it far easier to clean. For those who already have a countertop blender, but don’t look forward to lugging it out or washing the jar afterward—especially for small, quick blending tasks—an immersion blender is a handy alternative to have around. If you don’t own a countertop blender and want a tool that can accomplish 90% of the same functions with less muss and fuss and space-eating-up-ness, an immersion blender is exactly what you need. What can’t it do? We’ll discuss that further down the page—feel free to skip ahead—but first, we’ll lay out the pro–immersion blender argument. What Are Immersion Blenders Good For? If you and yours love soup that’s velvety-smooth, like a comforting tomato or butternut squash soup, there’s absolutely no easier way to achieve that luxuriously creamy texture than with an immersion blender. Many of our soup recipes call for sautéing aromatics in a saucepan, then adding the primary ingredients and stock or other liquid to the same pot and simmering before blending. An immersion blender allows you to purée the soup right in the cooking pot by immersing (get it?) the bladed wand directly in the soup mixture. Compare that with a countertop model, which requires you to ladle the contents of the pot into the jar and risk splashing yourself in the process. Plus, to keep steam from blowing the lid right off, we recommend that those using a countertop blender to purée hot foods fill the jar no more than halfway (and cover the jar with a kitchen towel instead of a lid, to give that steam an escape route). While there’s nothing at all wrong with this approach, it means you may have to blend in batches, depending on the recipe’s yield, making the process more time-consuming. Meanwhile, a hand blender is used in an open container by design, eliminating the need to take any precautions around steam buildup. Need more blended-soup recipes to put a shiny new hand blender to work? Try our quick mushroom soup, great for using up mushrooms that are past their prime; a colorful, savory squash soup with miso and dashi; a rich but balanced broccoli-cheese soup; or a spring-y asparagus and tarragon velouté. It’s possible to make mayonnaise in a few different ways—in a countertop blender, in a food processor, or even by hand using a whisk, a method Daniel is particularly fond of. But these approaches come with significant drawbacks. The larger appliances don’t work well unless you’re making a pretty big batch of mayonnaise; a smaller volume of ingredients is unlikely to come into direct contact with the blades, resulting in your egg yolk and lemon juice flying up and splatting against the walls of the jar or bowl instead of staying down near the blades where they need to be. Hand-whisking, though it may produce a more desirable texture, is fatiguing to those of us who aren’t Daniel, who, let’s be reminded, also gets enjoyment out of chopping a butternut squash into tiny dice. And all of the above methods depend on adding the oil in a slow, steady trickle, which requires a good deal of patience and control. An immersion blender, on the other hand, feels not just capable but eager to do the job, producing a creamy, delicate mayonnaise—as little or as much as you want—in record time. Instead of adding the oil in a slow-mo drizzle, you can simply dump it into the blending cup along with the rest of your ingredients. The size of that cup, however, will be key: It needs to be just barely larger than the head of the blending wand, which has to be planted firmly against the bottom of the cup, so that the blades can pull the layer of oil down into a vortex and perform the tricky task of dispersing it evenly among the water-based ingredients. For more guidance, see Kenji’s article on making mayonnaise using an immersion blender. Once you’ve mastered his original recipe, try adding flavorings, like herbs or harissa paste, and playing around with some of our variations, including vegan mayo made with silken tofu or aquafaba, and Stella’s egg white mayonnaise. Or, building on the same technique, check out our recipes for foolproof hollandaise and béarnaise sauce. Want to remove one step and one dish from your morning smoothie routine? Toss that frozen fruit, yogurt, spinach, ginger, and whatever else makes you feel bright-eyed and virtuous in the morning directly into a glass or tumbler that’s wide enough to fit the head of your immersion blender. Lower the blending wand into the cup. Turn on. Blend. Drink. No jar to clean or interlocking blades to disassemble; just detach the wand when you’re done and give it a quick (careful) wash by hand or, if the manufacturer allows, put it in the dishwasher. Smoothies by the batch are no less easy, since all you’ve got to do is increase the size of the vessel and the volume of ingredients accordingly. Want to win the Breakfast Host of the Year award by creating individual smoothie blends for a group of guests? Well, sounds like you might be trying a little too hard, but with an immersion blender, that award can be yours, with a brief rinse of the wand between cups. If you like your smoothies frosty-cold, note that some immersion blenders aren’t so effective at crushing ice, though the top picks from our immersion blender review were able to pull it off. On this topic, Stella doesn’t mince words: Cream can’t truly ever become whipped cream unless you incorporate air into it via a whisk, whether that’s a balloon whisk held in your hand or the whisk attachment of a hand mixer or stand mixer. The result of processing cream with the flat blades of a blender is something closer to a soft butter, not whipped cream at all. Still, it can be a delicious soft butter, and there are some advantages to the much denser and less fluffy cream topping that comes from a blender or a food processor. (For instance, Stella’s fruity whipped cream, made by combining freeze-dried fruit, sugar, and cream in a food processor, is a lot more stable than the real deal, which will deflate if not used immediately.) Beyond that, we acknowledge that the speed and ease of this blender-style take on whipped cream make it an appealing option. If you’re going to take that route, sticking an immersion blender into a cup with a few ounces of cream is, once again, tidier and quicker than getting out a countertop blender. Some immersion blender models, including the All-Clad and Hamilton Beach that we recommend, can also be outfitted with a whisk attachment for whipping cream or egg whites, either as part of their standard set of accessories or for an extra cost. We haven’t thoroughly tested these attachments, and they're not a real substitute for a stand-mixer whisk, but they'll successfully whip cream, and do so more quickly than you'd be able to by hand. Small blending tasks aren’t just more convenient with an immersion blender; they also get done better. A hand blender performs at its best when all you need is a little bit of purée, making it our top choice for low-volume tasks. That includes making a slurry from water and just a couple ounces of rolled oats for Stella’s Vegan Chocolate Chip Cookies, blending up half a can of tomatoes and a bit of ginger for Kenji’s chickpea and spinach stew, and puréeing a basket of fresh blackberries for Stella’s blackberry cake. 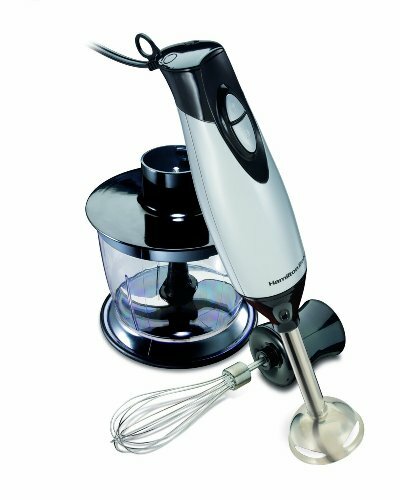 Besides that, though it still needs to be plugged in, a hand blender’s portability means it lends itself better to being toted around the kitchen and whipped out ad hoc. Whether you just need to touch up a creamy soup that didn’t come out quite creamy enough or quickly purée a few chunks of sweet potato for the baby’s dinner, an immersion blender makes every small or last-minute blending task feel smaller, and therefore more manageable. However dedicated a cook you might be, no one has unlimited money and space to acquire every single potentially useful kitchen gadget that’s out there. One question we’ve often seen from readers in the past is how to assess whether a particular tool provides a benefit that’s sufficiently unique to merit the investment, or if its functions are easily overlapped by those of another, more versatile piece of equipment. Immersion blenders are a frequent subject of such conversations. But it’s hard for us to answer that question without knowing the peculiarities of each cook’s situation—how often you bake, for instance, or how often you prepare food for a large group, or whether you have a dishwasher. The best we can do is to describe a few of the arenas in which an immersion blender falls short or can’t replace another tool, and allow you to figure out whether any of these is a deal-breaker for you personally. For instance, grinding up nuts into smooth nut butters is beyond the capabilities of most immersion blenders, as is thoroughly crushing ice. Other tasks, like creating a thick bean purée for hummus or making a large batch of soup, can be accomplished with a good immersion blender, but may take a lot longer. That could cancel out the other advantages of such a blender depending on your needs and cooking style. Limited chopping ability. The much smaller blade and tightly enclosed head of an immersion blender make it less than adept at chopping up dry ingredients, like the carrots and celery used in a mirepoix. If you’re hoping to skate by without a food processor and use an immersion blender for such tasks, you’re out of luck. That said, some models do come with a mini food processor that attaches to the engine portion of the wand; they're not very high-powered, but some of our editors have successfully used them for chopping a smaller volume of ingredients in a pinch. You must choose your vessel wisely. The big advantage of an immersion blender: You get to pick the vessel you blend in! The disadvantage: You have to pick the vessel you blend in, and it can definitely affect your results. Don’t try to use a hand blender in a pot that’s just a couple inches full; you’ll end up banging into the pot with the blade, splattering its contents all over the sides, and not effectively blending the thing you want to blend. And, as mentioned above, our homemade-mayo recipes will not work unless you’re using a vessel that’s just barely wider than the head of the blender. Possible safety risks. Immersion blenders have gained a reputation in some quarters for being more dangerous than other bladed kitchen tools. As this New York Times article from several years ago describes (warning: gory details within! ), users who forget to unplug their hand blenders before attempting to clean them put themselves at great risk for serious injury, thanks to the combination of razor-sharp blades and very sensitive power switches. Don’t become one of those people. Of course, blade assemblies for traditional blenders and food processors are also sharp and should be handled carefully, but, as they’re nestled within a work bowl or jar while the tool is in use, they’re less accessible to absentminded fingers than immersion blender blades. What Immersion Blender Should You Buy? There are tons of immersion blender models on the market, but only some of them are worthy of your consideration. Luckily, we’ve already sorted through them for you: Check out our immersion blender review for our recommendations, as well as details of our testing process and notes on the contenders that failed to make the cut. Miranda Kaplan is a senior editor at Serious Eats, a full-time word enthusiast, a lazy cook, and a hard-working eater. Before Serious Eats, she was a freelance copy editor for Bon Appétit, Vanity Fair, GQ, Condé Nast Traveler, Time Out New York, and many other publications. She lives in Atlanta, where she is always looking for a new dive bar.